Ask yourself this question, “Is there anything you are currently doing or not doing to tear down your household?” Whether it is your critical spirit as we discussed a few days ago, or your procrastinating ways as we mentioned yesterday, everything we do has the ability to tear down or build up our homes. Today, we are going to begin the journey of putting our households in order. There is much work to be done, however, we will be taking it one day at a time! Creating your Household Management Book will take some time, so don’t worry if you feel overwhelmed. It will become your best friend! In your devotion this morning, ask God to help you build your home up in the ways of the Lord. It is not enough, however, to simply ask God to help you if you are not willing to work cheerfully toward your goal. Rarely in this life, is anything instantaneous. If you have a bad habit, it will take time to change it. The good news is that anything is possible with Christ by our sides! Today we are going to put together a pretty and functional Household Notebook. I want this notebook to speak to your personality. So, take a few minutes and look around the internet for pretty pictures that you can save to your computer. There are many free graphic websites and photo sites that are in the public domain. Then I want you to open a text file such as Microsoft Word and paste your photo or graphic into the document. Below that you can type in a favorite Bible verse or other saying that you like. Print it out and place inside the clear pocket of your Binder. If you do not have a clear pocket on the front of your binder, you can simply print it on card stock and punch holes in it for the front of your notebook, or place it inside a sheet protector. Or, if you scrapbook, you could make a pretty cover with your papers and embellishments. I want you to begin printing pages for your notebook. 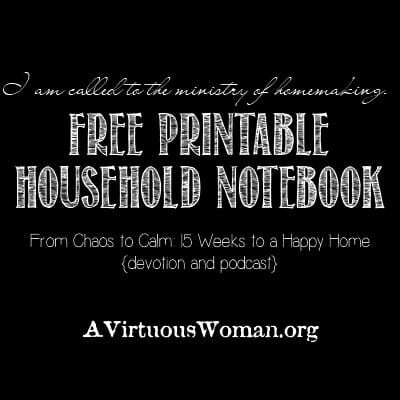 You can find pages for your notebook in the Free Printable section of A Virtuous Woman. 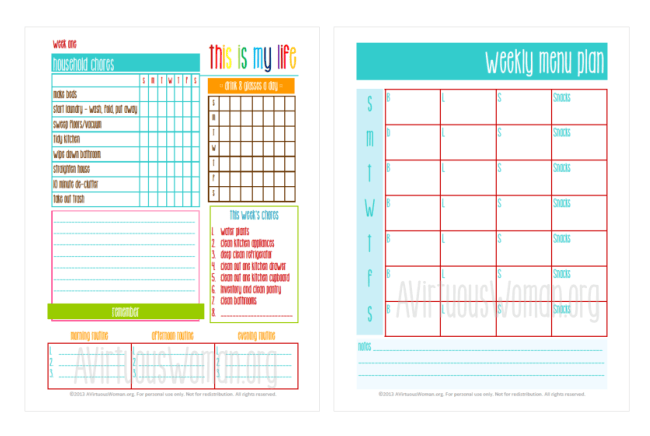 Or you can purchase one of my “This is My Life” Planners here. Once you have printed enough for a month, you can punch holes in the pages and place them in you notebook. Your morning and night routines will be key to keeping your home in good order. In fact, the night routine may be the most important part of your day! In the evening, you need to clean up the kitchen after supper. I have found that by having an early supper, I can get the kitchen clean easier. With small children at home, it is imperative that I have time in the evening to clean up. With bath time, family worship, homework, and other activities that go on, the evening can be one of the busiest times of the day for a family. So, by preparing ahead, I can have supper on the table at an early hour and get the kitchen cleaned by 6:30. This leaves me free to do a quick clean up around the main areas of the house, enjoy family worship with my children and prepare them for bedtime. Before I go to bed, I can put away any left over dishes, wipe down my counters and sink and go to bed with a clean kitchen – at a decent hour! Tidy kitchen and sweep floors. Wash one or two loads of laundry. 10-minute declutter of one catch all space. The above routine, if done consistently, should be completed by 9:00 in the morning at the latest. In your Daily Schedule you can add your other regular chores. We will talk about cleaning the house in a few days. For now, write down those tasks you feel you should be completing on a daily basis and put them into your daily schedule. You may decide to adjust it as time goes on or as circumstances change and that is okay. I am constantly redoing my schedule! Learn more about This is My Life Planners here. You can print my basic Household Notebook here. You can see pictures I’ve posted in the past here. These pages will get you started. Of course, like I said, you can find lots of Basic Household Notebook pages here. I’ll share more printables for your notebook tomorrow! 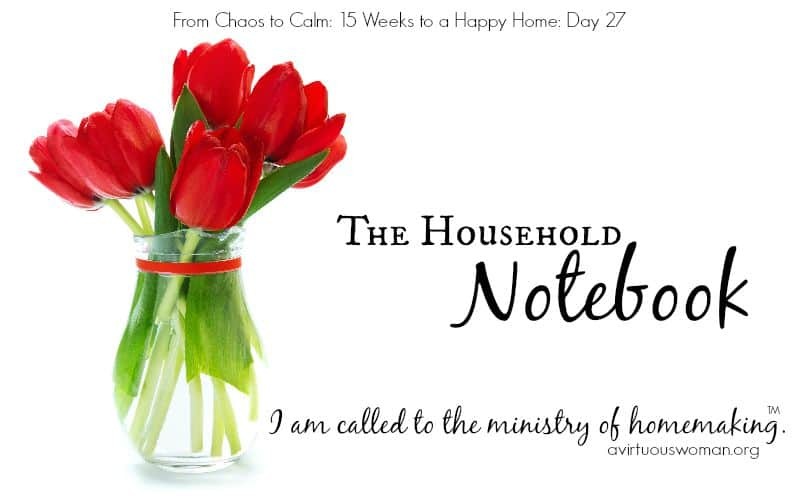 Over the next few days I’ll be sharing my current household notebook with you. 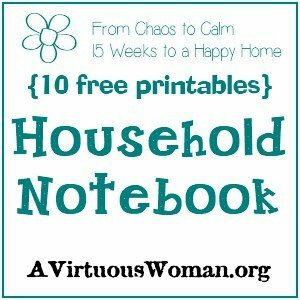 If you’d like to share your household notebook with me, post to Instagram with hashtag #fromchaostocalm and I’ll follow you! Like I said a few days ago, I simply adore Instagram! 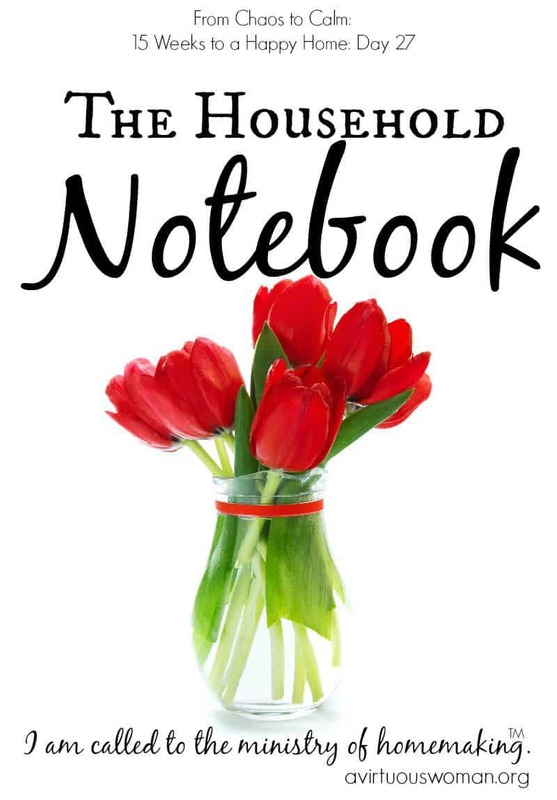 Have you used a Household Notebook in the past? I have recently stumbled upon your website and am starting to love it. My only question is how on earth can a working mother accomplish what is out lined on a daily basis? I would love to be able to follow what you have suggested, but obviously this has to be for the stay at home mom? right? Marion, I'm planning to write a blog post for this coming Sunday on this topic. So check for it then! Thank you for sharing! I had baby number 4 and moved two months later to a house twice as big as well as completely changed our diet. Ever since I have not been able to get back into any sort of routine. Cleaning was not happening at all. I hope to be able to get some direction and plan. I am a schedule person and its driving me nuts. I am hoping this will get me back on track!! Lindsay, when life seasons change it can be difficult to adjust - but with God all things are possible! I hope you find some balance soon! Do you have and suggestions for working moms? I want to be home so badly but I can't right now and desperately need balance! Work is killing me and my family! Robin, I really sympathize with your struggle. I've always been a stay at home mom/ work at home mom. So, in general I write from that perspective. I work from home and it's a real challenge to find time to get everything done. I try hard to keep the main areas of my house neat so that at least when we have company or people stop by they don't walk into a disaster. But then my house is rarely what I would consider "company" ready - unless we have company coming. That seems to spur everyone into a cleaning frenzy. Even my kids feel the need to get it all done if we have someone coming to stay with us. These days, as my life has changed and our schedule is different from when my kids were younger - I'm gone from home quite a bit. And then I have to get all of my regular housework done as well as get all of my writing/ blogging work done. I always say I work in the in-between times of my life. I will try to get a post up offering suggestions for juggling life and work - look for one on Sunday. I'm so happy I found this website! I read Titus 2 and Proverbs 31 and I have been looking for help in learning more about how to manage my home, life and relationship the way God intends me to. I don't know a lot of women who are married and following the Lord's will. Thanks for the information. I will work on my planner and start this series from day 1! It's nice to meet you, Jai! I'm glad you found A Virtuous Woman and too and look forward to getting to know you better! I've needed to do this for...far too long. I've always wanted to be on top of these things. And then I just either don't have the energy, patience, or motivation. But in the end, that's not working for our home any more! I'm decent at getting the bigger tasks done - such as laundry, dishes (when necessary, not daily), and a mostly clean bathroom - but it's the littler things like tidying that are so important that I just glaze over, which does my home no favors! Jessica, I totally understand - it's easy to lose our motivation. And it's definitely harder when we're tired! Clutter is a constant battle for me, but I always feel better after tackling it!